The last time a baseball team from Milwaukee made it to the playoffs I was just becoming potty trained and mouthing my first few words, “Robin Yount!” Ah, those were the days! This year the Brew Crew barely squeezed into the playoffs as a wild card. 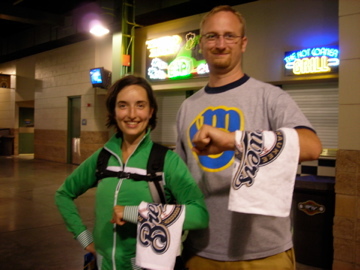 I am excited and proud to say that I am a Brewers fan. Though I do not support the binge-drinking associated with Miller Park, I am a big fan of the sourkraut filled brats and the 7th inning stretch Weiner Race. Go Polish Sausage! And let’s go Brewers. Roll out the barrell and get another win for Bernie and the gang.